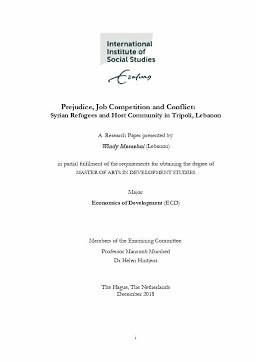 This study investigates the root causes of Syrian refugees and Lebanese host community non-violent conflict. To understand the tensions, it was first necessary to consider the political history of relations between Lebanon and Syria. The study examines the case of Tripoli, the ‘capital of the North’, a town that hosts almost 45,000 Syrian refugees. The researcher focused on a social cohesion analysis, through economic factors such as employment and livelihoods, as well as social relations and trust among others. The results show that competition on the job market exacerbates tensions and undermines social cohesion. A survey was conducted to test the hypothesis that inclusive employment can alleviate tensions between local-non-local communities, contributing to social cohesion. However, the study found that historical conflicts and prejudices undermine this option. Interestingly, such hostilities can appear among both the younger and older generations (mainly Lebanese). In contrast, Syrian refugees mostly expressed appreciation of their hosts, independently of their status of employment or vulnerability.